Worcester prop Nick Schonert faces a lengthy injury lay-off with the ankle injury he suffered on Sunday but scans have shown there is no break as first feared. 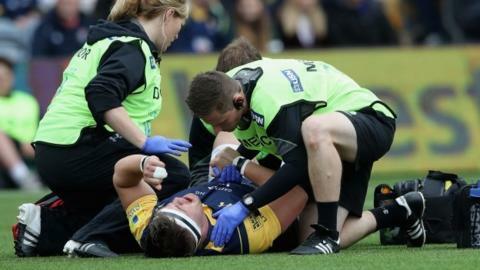 Schonert was carried off after being injured in the first minute of Sunday's 24-10 home defeat by Wasps at Sixways. But stand-off Tom Heathcote may be fit for Friday's visit of Exeter despite suffering another concussion injury. Boss Gary Gold hopes backs Ben Te'o and Jackson Willison can shake off knocks. "Te'o is struggling with his arm and Willison is struggling with a rib, but hopefully they will both be ok for Exeter," Gold told BBC Hereford & Worcester. "Schonert's injury looks like badly ruptured tendons on both sides. He hasn't broken his ankle, which is good, and some consolation but it still looks likely to be a significant lay-off." Schonert's injury caps a grim summer for the 25-year-old South Africa-born tight-head. He was called up by England for their summer tour to Argentina, only to be ruled out with a hand ligament injury. Warriors must wait to determine whether Scotland international Heathcote will be fit to face Premiership champions Exeter. Heathcote, who missed most off last season with two concussion injuries, suffered another blow in Sunday's home defeat by Wasps, his first home Premiership start in 11 months. He came off the pitch for the now statutory head injury assessment (HIA) following a heavy challenge from Wasps' England forward Nathan Hughes. He passed his HIA but was also suffering neck pain - and that will need to subside if he is to play again on Friday night. If Heathcote is missing, it will further weaken a Warriors backline already missing fellow stand-off Ryan Mills (two/three weeks, shoulder/hip), full-back Chris Pennell (one/two weeks, quad muscle) and scrum-half Luke Baldwin (five/six weeks, bicep) and centre Wynand Olivier (hamstring). Warriors are also suffering problems in the pack as, before Schonert's injury, they were already deprived of locks Will Spencer (ankle) and Darren Barry (five/six weeks, quad muscle), and flanker David Denton (two/three weeks, calf/Achilles).